Great quality. Thick walled glass. 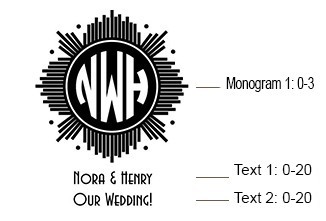 The copper colored font is exactly as pictured. They turned out beautiful. Arrived within 10 days. very pleased. everyone loved them. great buy. We ordered these wine glasses as a wedding favor. 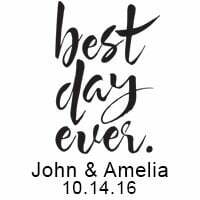 We ordered these glasses 42 Days before the wedding praying they come before and they. 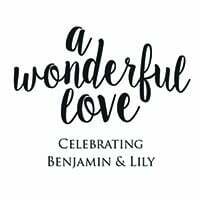 We received them 25 days before the wedding. What a relief and surprise. The only thing they are a lot smaller then we expected. But all in all I think our guest will be impressed with their gift. I love how the turned out. They are the perfect size and once I put them in a 9oz sized gift box they will be the perfect favor. 9oz is smaller than stemless glasses seen in stores, but they are a great size. I chose the copper writing and it looks great against the clear glass. 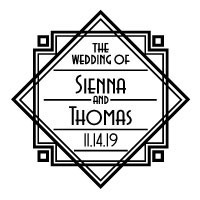 Purchased for my wedding and they came out great. Shipping was fast and none were broken on arrival. I think I was expecting them to be a little bigger, but we like them anyway. 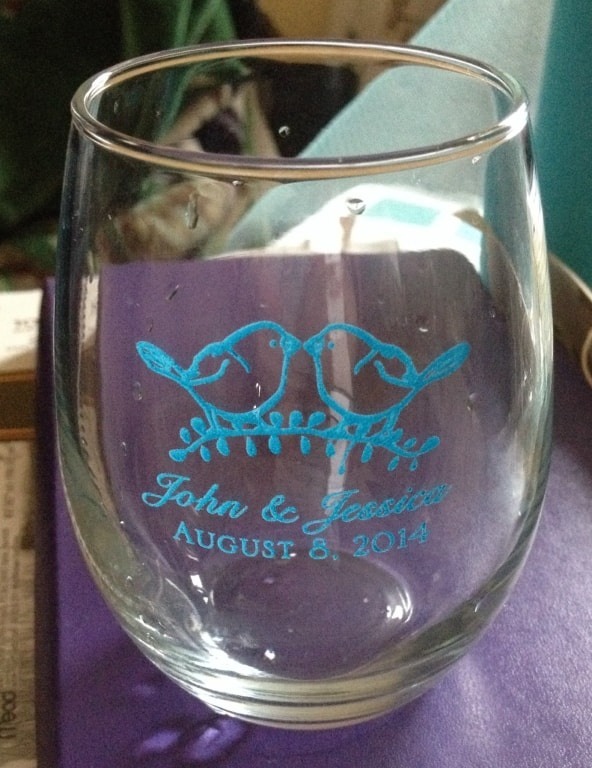 I ordered these glasses as wedding favors and they turned out great. Upon receiving them, I was worried that we may lose a couple due to shipping but they arrived without any damage. Our guests loved the glasses and I would definitely order these again! Thanks Beaucoup for quality products and service. I received a couple stemless wine glasses as a gift from a spa. I loved the glasses and use them for wine, juice or as a shot glass. It's just so perfect that I decided to give them away at my retirement celebration. I gave away over 100 and everyone loves them. If you are considering the stemless wine glasses, make sure you pay attention to the size options. I ordered from my phone and didn't notice the options when I placed my order. 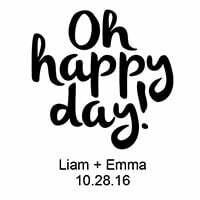 I was so excited for our favors until they arrived. The 9oz glass is SO tiny and not at all what we planned on giving our guests. Was this helpful?Yes|No 2 people found this helpful. 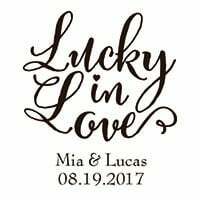 These were used as favor at our wedding. It was a low key wedding but instead of giving everyone a solo cup, we gave them a glass they could also take home! We got so many compliments on them and they have held up well after multiple uses. 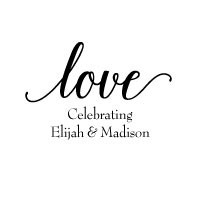 Loved this as a small yet usable wedding favor. Great wedding purchase, guests loved these! These glasses were the perfect size! 9 oz (so a full wine pour is 4-5 oz, which is the halfway point in this cute glass) was just enough. They arrived all wrapped in bubble wrap and in small cases, and then shipped in a bigger box. Not one design was smeared, which we read happened to a few others who reviewed on here. Our guests LOVED them - we filled them with copper-wrapped Rolos at the tables, and some guests used them later at the bar when they wanted wine. We didn't have to take any home - big hit! Was this helpful?Yes|No 3 people found this helpful. Beautiful glasses, great wedding favors! We bought one for every guest at our vineyard wedding. People loved them and loved that they would get to use them again and again!! Great quality, fast shipping! None of them were broken! Received my order yesterday and am more than please! The 9oz. stemless wine glasses were beautiful and exactly what I expected. I ordered 50 and all arrived in perfect order. Not one was broken even though the outer box had been a bit manhandled in transit. Would definitely order from Beau Coup again should the need arise. 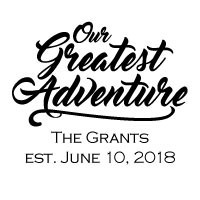 This was a great favor for our wedding! It killed two birds with one stone: I didn't have to rent wine glasses and the guests had a nice favor to take home. I figured it would be a useful gift, since everyone can use extra wine glasses at home for parties...glasses that they won't care if a party guest breaks. Not a single one broke in shipping!! I ordered extra just in case, but didn't need to after all. I washed them all before using at the wedding reception. The personalization did not wear off in the dishwasher. The glasses are surprisingly thick & heavy for being such a good price. 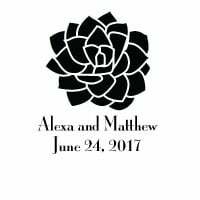 Purchased these for my sons wedding rehearsal dinner that we were hosting. Great idea and lots of positive comments. One of them even dropped on a cement floor and did not break. Would highly recommend. 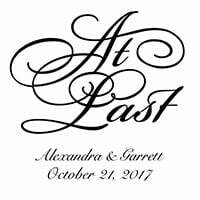 Our planning was late, but when a rush order was placed I was able to track the order and received everything on time the week of the wedding. The packaging was great, no broken items, but the work began where the boxes had to be formed, glasses had to go into the boxes and ribbons had to be tied around it. All in all, I give the product 5 stars. Our wedding guests were happy with their beautifully packaged gift. Thank you!!! I had previously posted a review about the importance of checking each glass when it arrives, that some were broken, some were smudged, and some didn't even belong to us. HOWEVER, now I find the need to post the AMAZING Customer Service I have received. They have been diligently working with me, and have shipped replacement glasses with an apology for inconvenience. How great is that!!! I didn't expect this since I didn't check my glasses, but they came through for us! WOW! Beau-Coup you rock! 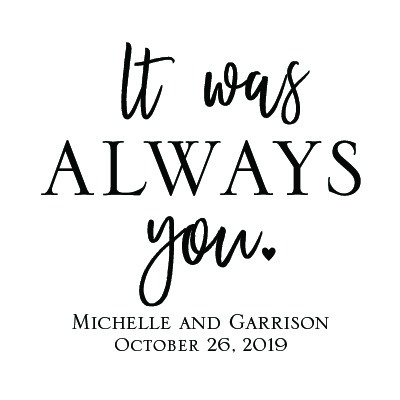 At the last minute I overruled the "sand in the bottle" idea that the bride wanted as a wedding favor and opted for the personalized 9OZ stemless glass. The order had excellent tracking, customer service was able to give me an up-to-date response a few days before delivery and everything came at once at the time expected. All of my glasses were in tack, the window boxes that were ordered for the glasses are adorable with quality, along with the quality ribbon enclosed. Two thumbs up!!! No negatives, just allow enough time to form the boxes, tie the ribbons. I would recommend using circle glue adhesives to hold glasses in the box to have the message shown facing correctly through the windowed boxes. These came out really nice and the bridal shower guest really liked them. The only con I have is that the glasses are not the size of a stemless wine glass. 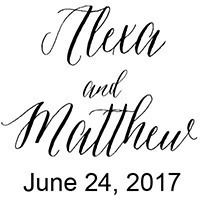 I ordered these for my wedding... Kind of last minute, but it was worth it. I ordered them on July 13th and received them on the 28th. 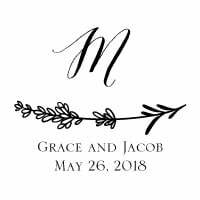 My wedding was on the 30th and so on the 25th I got nervous and emailed the company. Andrea reassured me they were set to arrive before the 30th and not to worry. Only about 5 were broken out of 160 but I had expected some breakage so I had ordered extras. 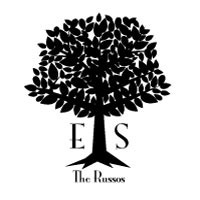 This company is amazing! I have already recommended them to friends. The glasses couldn't have been more perfect! Great quality, good keepsake, very happy with them! We used these for any drinks and as a gift to take home at the rehearsal dinner. They were perfect people loved them. Used these for favors at my son's rehearsal dinner. Wonderful! We used for toast at Rehersal dinner....everyone loved them and not one left behind. I planned a surprise 30th wedding anniversary reception for my aunt and uncle. These personalized glasses made the perfect gift. Presented in an all white box with yellow bow added a special touch to the adorned tables and place setting. Absolutely adorable! These stemless wine glasses were fabulous! I loved the way these turned out. We used them as keepsakes for guests and as toasting glasses for our wedding. The paint was a little spotted on some, but overall I feel that these are a good value and a cute item for guests to keep. I probably would have chosen a larger class in hindsight, but they turned out great. 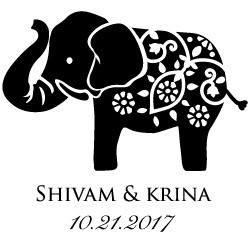 Our wedding guests loved the unique favors! The glasses were a big hit at the wedding! We chose the bride and groom in the car which was a very unique image. I gave this item 4 stars because a couple of the glasses had printing streaks around the glass. Don't worry, 2 glasses with flaws out of 130 are really good odds! All around wonderful product for a very affordable price. Just got these today for a party we're having in June. They came VERY quickly and the quality is awesome. 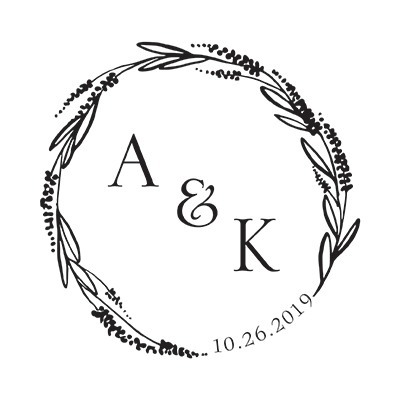 I was skeptical at first due to all the reviews saying theirs came smudged and/or broken but all of ours were perfect and we even got an extra one! Overall, my husband and I are very happy with these. Rehearsal dinner favor. Looked great and much more expensive than they actually were. A big hit! Glasses were a hit, should have bought the larger glasses but nine ounces were fine. A couple glasses were broken but not worth it to send shipment back for just a few. Good value and well done. Would do again!! These glasses were the favor I gave at a bridal shower for my future-daughter-in-law. Everyone loved them!! I would buy these again if I needed another favor. Beautiful! Can not say enough, everyone loved them! 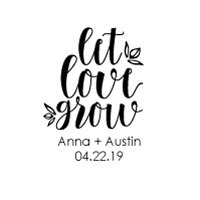 We ordered these for guest wedding favors. Everyone wanted 2nd's haha. Very pretty, perfect size. 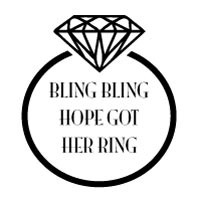 Going to use as the favor at our wedding. Arrived quickly, great quality. A little smaller than I was thinking it would be, but beautiful keepsake. My wedding is in July of 2016. 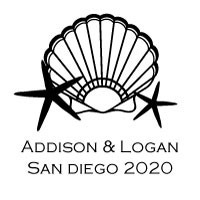 And I must say after reading all the reviews I was very worried on how they would come out.. but I went ahead and order 100 wine glasses personalized with our names and a beach monogram. . 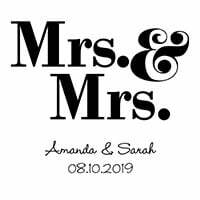 The came about a week and a half after we ordered them.. My fiance and I went through each and everyone of them thoroughly and they came out perfect.. we chose the light blue being out theme is Beach.. they are a bit small but as a favor I believe they are perfect especially if you on a tight budget.. I don't normally write reviews but after seeing for myself, I figure I write my opinion.. I recommend this product.. Thank you. 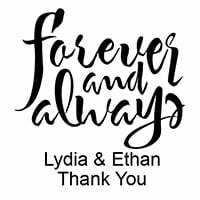 I purchased these favors for my daughters wedding. I ordered 220. Poor quality. The personalization is not the same. Some of the glasses have bold writing and some glasses the writing is so light you can barely read it. Some glasses were not able to be use and I had to keep calling customer service to get them replace. the red ink is not dark enough and you can not read it. 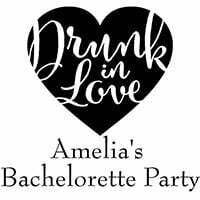 We ordered 80 stemless wine glasses as favors for our wedding in May. We inspected the glasses as soon as we received them and found about a dozen had small chips or smeared print. Another minor issue is the dark blue color we chose varied a lot from one glass to another, from dark to medium to light blue. The quality control appears to be really poor. We immediately contacted Beau-coup about the dozen defective glasses and took time to take and send pictures as requested. 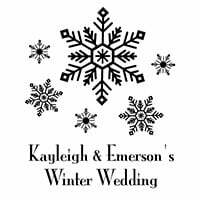 We were reassured by their representative that they would send replacement as soon as possible to make it in time for our wedding but 4 months later we never received them, very dissapointing experience. Cuite ~ perfect ~ as expected! Ordered 120 personalized glasses with black writing. Received 122 glasses, all in perfect condition. The glasses are small, but after reading the reviews and taking my own measurements, I expected this. In my opinion, the glasses are cute & perfect! Customer service was great in helping me chose the writing color. The reviews, description and price made me want to buy the product, which I did. Unfortunately when I received them, some were sent with someone else's personalization (human error) and the glasses were MUCH smaller than anticipated. I would not use them as a wine glass but rather throwing some candy in them, or possibly use them as a votive candle holder. Next time I would spend the extra money for the larger size. I should have done more research on the. The ladies in customer service were very helpful and accommodating. Used these glasses for the Mimosa Bar at my daughters Champagne Brunch. Perfect size and guests keep their glass as a party favor practical and really cute! I love this wedding favour. The boxes should have been included instead of being sold separately however I feel at the end that it was really exceptional. If the price was a little lower I would have bought much more. Cute glass for rehearsal dinner but much smaller than expected. Will still make a nice keepsake for guests. I looked everywhere for personalized stemless wine glasses for favors. I had some picked out but decided to look around one more time, and good thing I did! I found Beau Coup where the design was cuter than my first choice and they were cheaper! Absolutely love them! Thanks for helping mark another thing off of my to-do list! 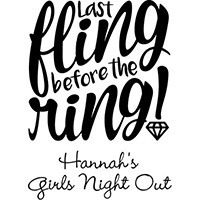 The Perfect Favor for a Bridal Shower! 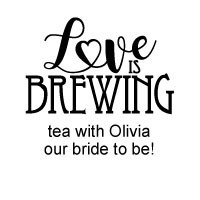 A personalized gift to give to all that attended our Bridal Shower....add a small bottle of wine and this makes an awesome favor for guests to take home! 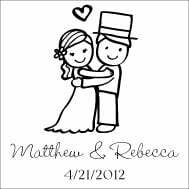 Loved the personal design there so cute and true to size can't wait to give them as favors at my wedding!! Very happy with our choice! These wine glasses are the perfect "favor" for our guests at our Italian/vineyard/wine-themed outdoor wedding. We are placing personalized Hershey kisses and Jordan almonds in organza sacks inside each glass. -The printing is very well done and clear and the colour used is exactly what you see online (i picked the gold). -The glasses themselves are a little smaller than I imagined but then again i'm not the best when it comes to measurements. -The shipment time was exact and everything arrived very nicely packed. Nice product for the price. The only problem was we ordered 135 of them and 15 came all shattered and broken and 9 came with letters rubbed off. They did send out replacements right away. Other than that everything was perfect! 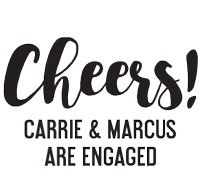 I bought these as our wedding favor- it's adorable and something personalized, but they're also functional and we save money since they would need a glass anyway! 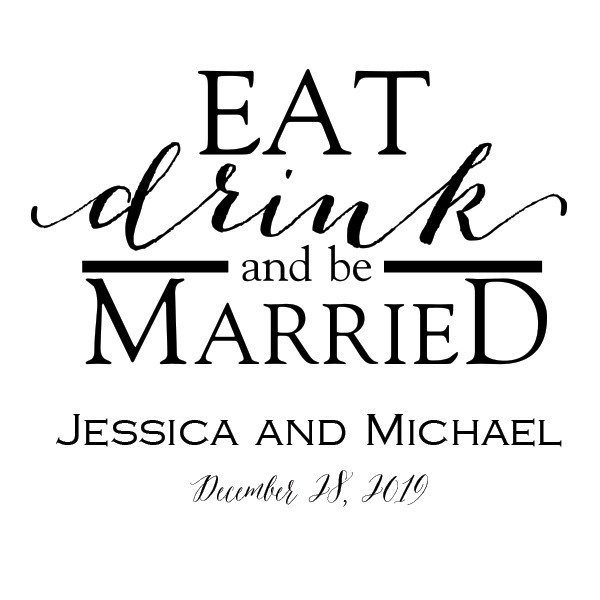 I bought the 9 oz steamless wine glasses as favors for my sisters bridal shower, i plan to fill with candies, I love the fact that they actually had a chandelier picture, no one had them, i absolutley love them and they will be perfect! We had a Ladies Harvest Luncheon at Church for 80 women. I ordered these little glasses for a layered cheesecake dessert that each lady then took home as a 2014 keepsake. They literally only hold 9oz. but were PERFECT for our event! Especially with the personalization! Beautiful! Shipped fast! Packaged well, none broken and they sent a couple extra. Great purchase! I wanted a special keepsake to give to our family and friends. These glasses are perfect for our guests to drink from and then for them to keep. I ordered 48 and received two as a bonus item. 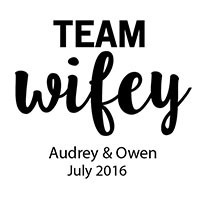 We ordered these as our Wedding Party Favor. Process was easy, turn-around time was great, so far so good, no broken glasses, though we did order extra's just in case there were a few broken ones. 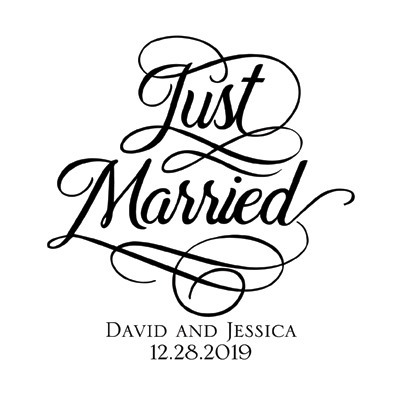 We also ordered the Boxes, which are a little time consuming, but if you not in a hurry or stressed out, it's not so bad having to fold and tie ribbon on each one. I am setting up a wine table across two oak wine barrels in my yard for my husband's 75th birthday! Used a tree of life decor item similar to the design on the glasses as part of the display. It will look awesome! 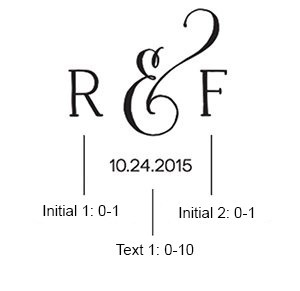 These were ordered for our wedding favors. It was easy to order and they called the next day to verify our order and had them in about 2 weeks!! 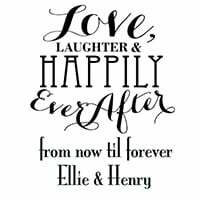 Simple, inexpensive and will work perfectly for our wedding. Bought these to use at rehearsal dinner as a keepsake but also for use during the champagne toast. 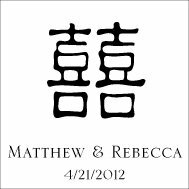 They are the perfect size and love the design (bride and groom with names and date). Look wonderful and they were packaged perfectly as well. These will be a hit at our dinner and help with a perfect start to a wedding weekend. 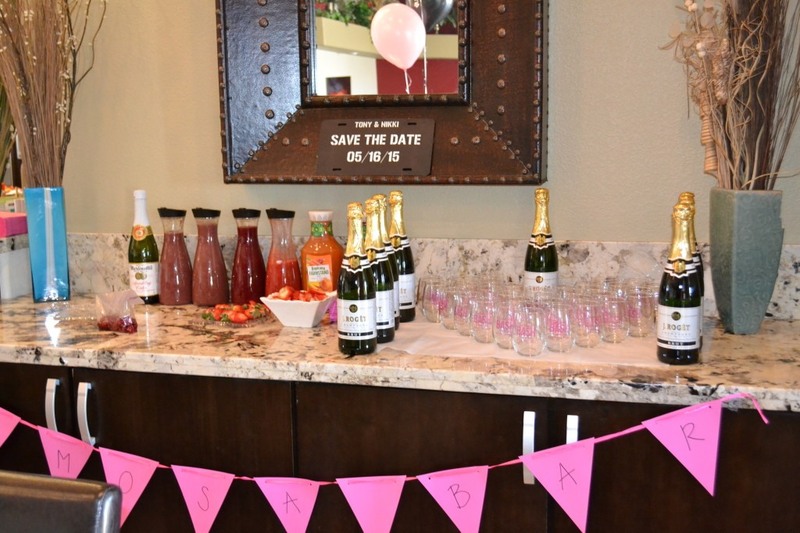 I loved the stemless wine glasses for my best friends bridal shower. 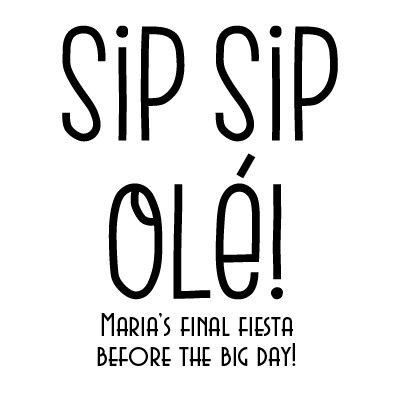 She loves wine and i thought what would be better to give everyone a glass thats personalized. It goes with my theme of alice in wonderland with the playing cards in black on them. I cant wait to give my guests them. Also it's something that they can use and it also was a good price! The wine glasses were exactly what I ordered. The personalization was exactly right and the quality was beyond what I expected. Will definitely be ordering from Beacoup again! Was looking for a favor for a rehearsal dinner-these were perfect. The soon-to-be newlyweds loved them! 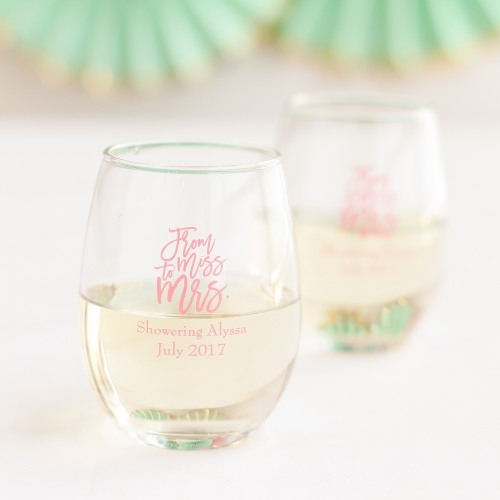 We are doing a wine theme bridal shower, so these monogram stemless wine glasses are perfect for the favor to give our guests. This glass for my wedding favor, they are so gorgious , thank you!! 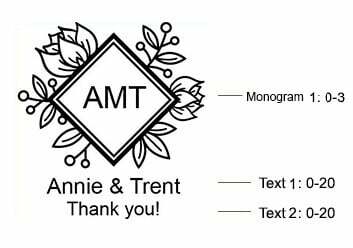 I had them personalized for my Daughter's Bridal Shower. Super Cute! I know they're get tons of compliments!! Thank You Beau-coup!! Beautiful and very well done. A little smaller than I had hoped. I like that it is a unique gift and useable. I have recommended this particular gift to several people planning a wedding. A Perfect Favor for a 40th Brithday! I loved these glasses as a favor for my hubby's 40th, I filled them candies and wrapped them up with cellophane, they were perfect! Everyone loved them! The product is good quality and if I need to order things like this again I will use Beau-Coup to order! I wanted to get these glasses as wedding favors and also to be served at the bar with wine for my guest. Since I have a low budget I decided to order 100+ glasses due to the personalization fee and also to get the discount. I would recommend getting one or two before hand. They actually turned out better then what I expected. I got the smallest wine glass but it's perfect for wine of course. The lettering is close together and it's not engraved. Usually you'll be able to feel a bump from the line on a good personalized glass with ink. These you don't feel the line and it looks a little cheap. Not too bad unless you really examine it close up. They were packaged very well and tight, none broke during shipping. These wine glasses were perfect! These wineglasses were great with the personalization of the shower on it and with the matching boxes and bows. We put in candy kisses that rounded everything out. It's a perfect size for a favor AND a place card holder! Also, people get to take it home and not only use it for drinking wine but possibly holding candles? No matter what it's ultimate function this was a great investment! Thanks beau-coup!!! 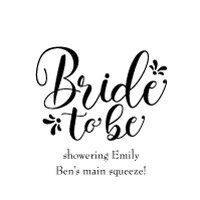 I bought these as shower favors and they came out looking great, and they are a good size! Best of all, I had issues with my order (i needed a larger quantity after the fact) and the customer service team was extremely responsive. I haven't used them yet, so I can't comment on their durability, but am very excited about them. These glasses were perfect favors for the bridal shower, we put a little confetti and chocolate kisses inside and put the glass in the organza bag which matched the engraved color and it was perfect! We had a problem with a few glasses broken but customer service was great, they replaced them immediately and in time for the shower. I couldn't be happier. When my daughter decides to have a baby I'll be shopping here for baby shower favors!! These glasses are beautiful. They also mailed a couple of extra glasses in case of breakage. I ordered the glasses for my daughter's baby shower. I really like them. My only complaint is that I would have liked the image down a little further on the glasses. They will be a very lovely touch to the shower. 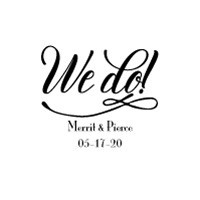 We are using the stemless wine glasses for a marriage celebration to use at the event and take home as party favors. They are beautiful! You can use them as juice glasses as well as wine glasses. We love the way these glasses look and how much they fit into out wedding. We are Italian and the plan is to actually put our traditional Jordan Almonds in them as well. 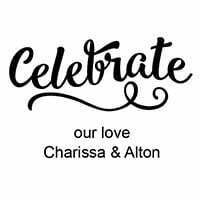 These were exactly what we were looking for as favors for our wedding because they are so unique. I must also add that they exceeded our expectations on quality because they are a much thicker glass than the thin and easily breakable glass we anticipated. 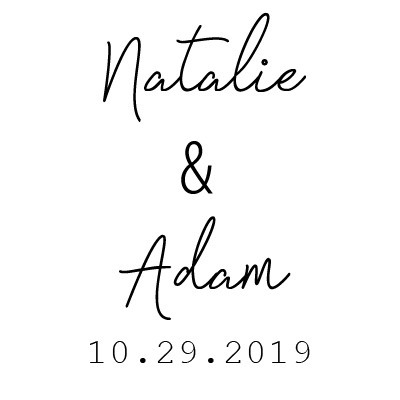 I loved the glasses when they arrived...I wish there were more color choices to choose from but they are great as my wedding favor I love them!!! Bought 116 of these stemless wine glasses as wedding favors. So happy with the outcome! I bought the stemless wine glasses with the sheer organza bags. 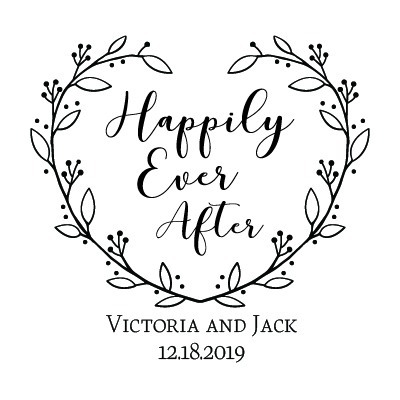 I was a little nervous that I might be disappointed by the size but if you're using them for a wedding favour, they are the perfect size, I am so happy with how they turned out!!! Also, my fiance wanted to get the white etching and I didn't because I didn't thing it would show up very well, but it is perfect and very bright and clear! Looks great!!! These stemless wine glasses are great for the wedding. We received them and they look better than what we expected. Wine for the rehearsal dinner will be served in these glasses (other beverages too). Each guest can take the glass home with them as a keepsake. Delivered very quickly. Product was just as I expected but, a little smaller than a normal wine glass. It's ok though, that just means people will have to drink less!! You can't beat the FREE shipping! this item turned out awesome. we r so happy with how the finished product looks. amazing. our only concern is the glass appears a little small could b mistaken for a short drinking glass instead of a stemless wine glass. 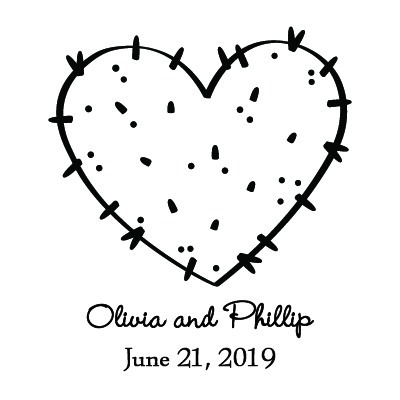 I purchased these for my wedding trinckets. The order was delivered promptly, and the glasses were well packaged. I will fill them with potpourri and present them at the reception to my guest. This should be a memorable keepsake for my family and friends. These glasses are useful and when people reuse them they will always think about my daughter. Bought these to give as thank you gifts for my wedding weekend guests. Was a little nervous about ordering glass, but SO GLAD I TRUSTED BEAU-COUP! The glasses arrived quickly, and were flawless! The quality is amazing! Perfect size! These are truly a wedding must have! Adds a touch of elegance & WOW factor without breaking the budget. 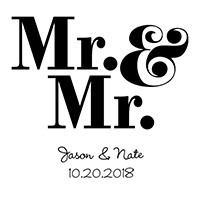 Truly my favorite purchase for our wedding! Perfect for our wedding favors - wine glasses for the ladies and we also got matching koozies for the guys. 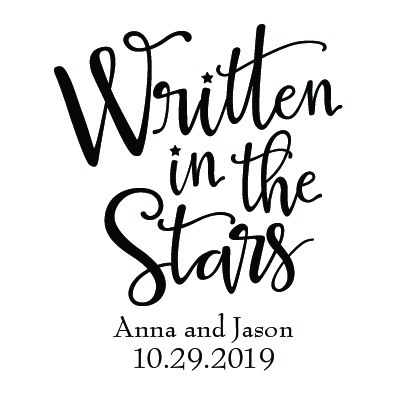 Can't wait to give them out on our wedding day! 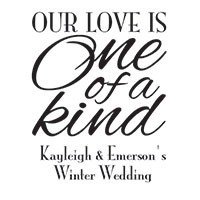 We are using these for our reception wine glass and they also double as our wedding favors. The are a nice heavy weight glass and the personalization came out great! We were also really impressed with the shipping. They were safely packed and nothing was broken. The only downfall is they are small, just like other reviews have mentioned. They are about the size of a juice glass. 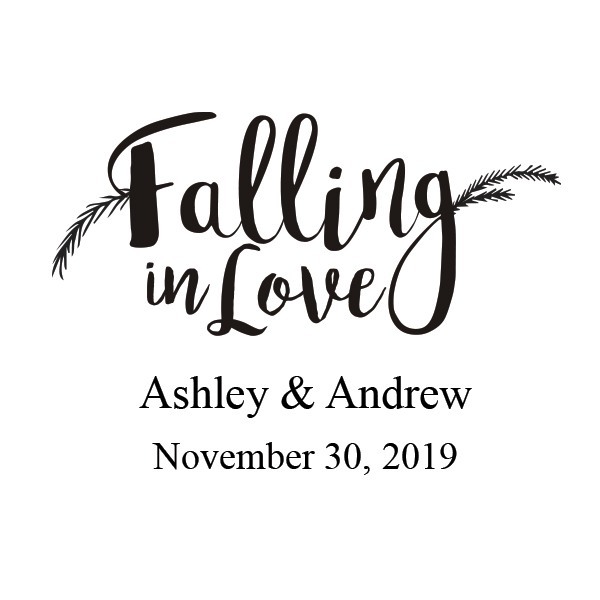 However, they are perfect for wedding favors. We love our personalized wine glasses. We order 10 extra in case a few broke in shipping but only had 1 glass break. They are a good size for guest favors. Wouldn't hesitate to order any else from this company. 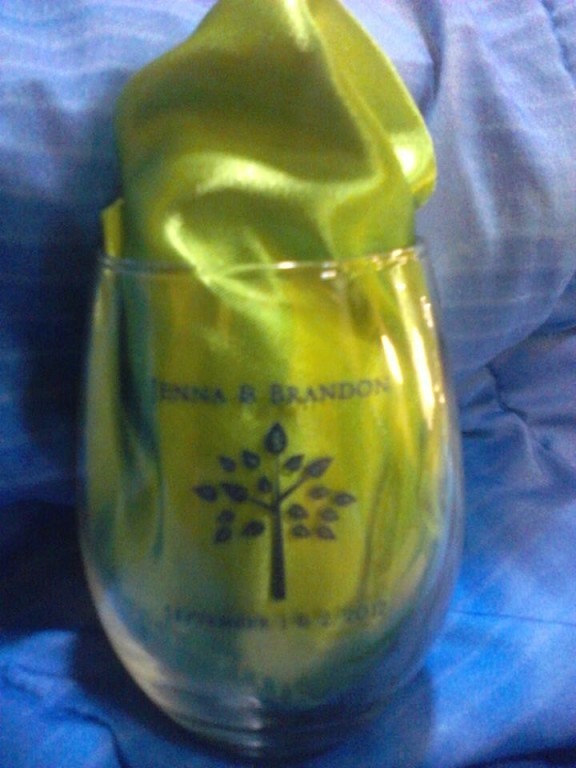 We are using these personalized stemless wine glasses as favors for our daughter's wedding. We are filling them with candy in an organza bag for our guests to take home. They are really stunning! have ordered merchandise before. very satisfied with product that is sent. I will continue to order when needed. These wine glasses are good quality but they are smaller than I thought they would be. 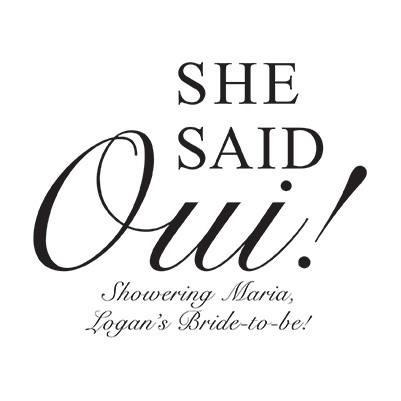 We served wine at the shower! Beautiful quality for a great price!!!! The stemless wine glasses I ordered were packaged so protective so they wouldn't break,very impressed.They are very elegant and personnel and my daughter's name was spelled right which alot of times I have to reorder at places because they spell it wrong.We are very pleased with the entire process very user friendly. I have already recommended your site to others.Thank you very much. Got these wine glasses as wedding favors and purchased the flat bottom organza bags to put them in! Perfect fit and very elegant looking in gold to match the gold engraving! Can't wait for the guests to see them. very nice but smaller than I had expected. they would be perfect for wine tasting. very nice quality...they will be great. I love to attend to details...these glasses do just that! I like this functional, personalized favor, however, it appears to be more of a candle holder than a stemless wine glass. The glass is thick and the size is small for a wine glass. Used as party favor for bridal shower.. Complete hit and happy with purchase. I ordered these glasses for my class reunion favors. I ordered 120, they sent 126 and only 1 had a slight imperfection. The engraving was really small, and I expected the glass to be thin; but these glasses are really nice. I would definitely order them again. You can't beat the price. The glasses look wonderful. 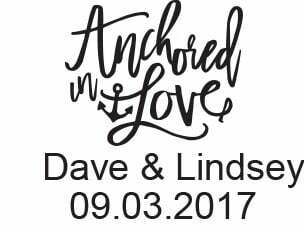 The inscription in navy matched my wedding theme. The corresponding navy organza bags purchased separately completed the sophisticated wedding favor. This was a great product. The guests loved it and thought it was a unique gift. It followed a theme we had in our wedding. We received this item very quickly & it is good quality. Guests were trying to leave with more than one so you may want to order extras! I purchased these glasses for our wedding favors. I wanted something that was not common or frilly and I wanted something that our guests would keep and not eat & dispose. My husband grew up in wine country and we are wine lovers (just like most of our friends)so this was a perfect favor for us. Only one thing is that I though the glasses were going to be larger based on the photo, I should've gave more attention to the measurements listed, they are smaller sized than a regular wine glass but they are good quality. The glass itself is great quality and the personalization adds an amazing touch. Although i orderd 300 glasses about 10 had minor issues with the ink smearing or very faint, but they had sent me 6 extra so no complaints here. It depends on how picky your going to be. For price its unbeatable. love them and they are going to look great at my wedding. 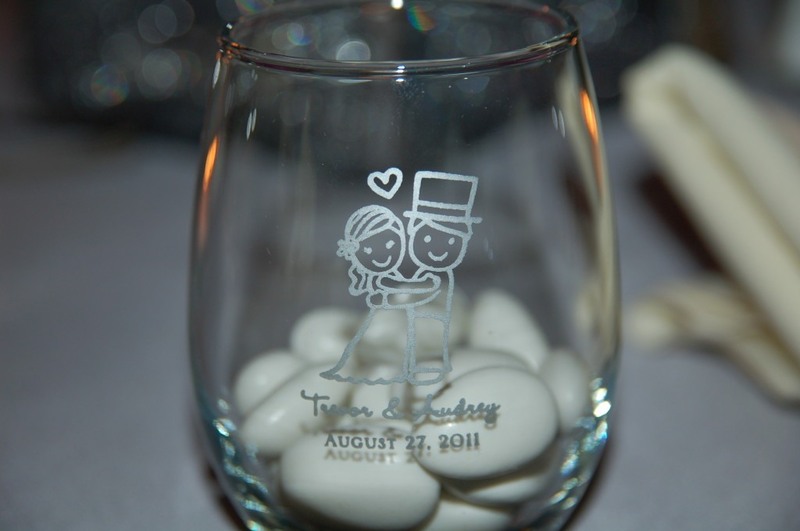 Loved these glasses, we filled them with candy and used them as wedding favors. 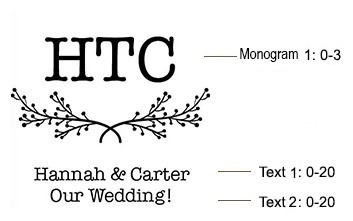 I loved the fact that these were actually useful favors that people can remember us/our wedding day for years to come. Beau-coup did a great job with packaging/shipping and not one glass was broken. My daughter, the bride, saw these glasses and wanted them for her wedding favors. 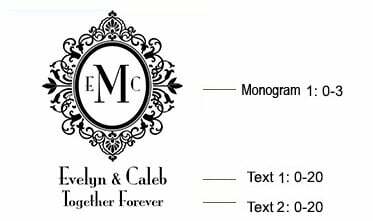 They are perfect size, nicely monogramed and great quality. We recommend them highly!! 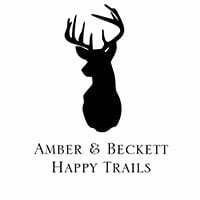 I was pleasantly surprised by the quality of the wine glasses, they have thick glass, not thin breakable glass and feel very sturdy.[... ].We ordered 120 and received 124 and there were only 6 with slight imperfections (2 had printing that was off centre and 4 with a small bubble in the rim). These glasses aren't full sized wine glasses but are still functional. We will be giving the glasses to our guests at our wedding as we are getting married at a vineyard. They are really cute and something different. 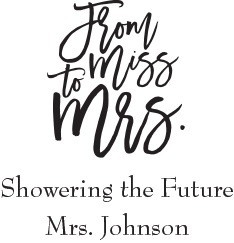 I ordered this products for a bridal shower for my sister in law[...] looked amazing. It was well worth every penny spent. I loved them, very good quality for the money. These are wedding favors. These glasses will look so elegant on the tables.. A Classy thank you gift for the guests. A gift no one will throw away!!!!! Location: Raleigh, NC by way of the Bronx. We personalized these glasses for the wedding shower and are setting up a candy bar. People will fill their glasses with candy to take home. I LOVE the glasses!!! I thought these would be great to have as votive holders at each place setting at my reception and be more elegant and interesting than regular shot glass sized ones. I was a little disappointed that they don't have more imprint color choices and the printing is crooked on most of the glasses but not so much that I want to send them back. The glasses themselves seem to be good quality and they are the perfect size and shape for my idea. We LOVE this item!! Beaucoup was also extremely helpful when I went throught my entire order - we had 12 out of 175 glasses that were defective...within 48 hours I had 12 new ones on my doorstep. Great Customer Service!! The glasses were nicer than expected. 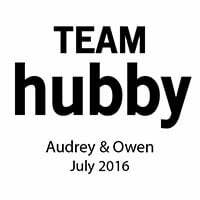 We haven't used them yet but I'm hopeful that the engraving will not disappear after a few washings. I love these stemless wine glasses. 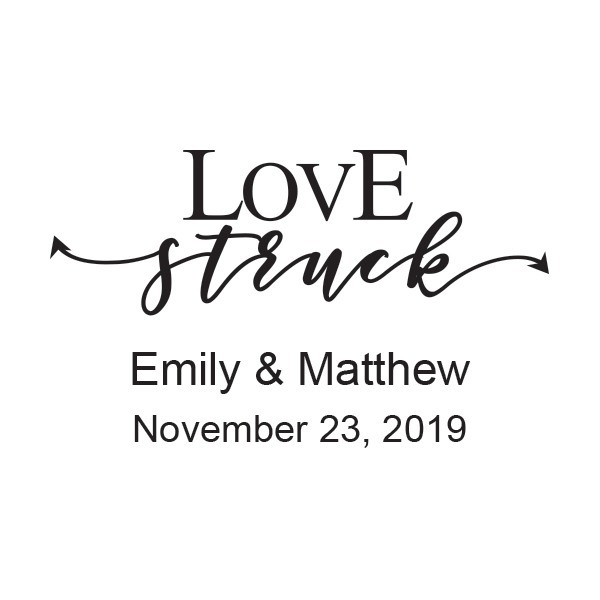 I ordered 170 of them as wedding favors for my guests. Best thank you gift ever! these glasses are great! love the way they look. these glasses are great for everyone and anything. i would buy these glasses again and again. The glasses are very cute and really do fit my theme. I just thought they would be a little bit bigger. I would have used them as candle holders if I would have known the size before I planned the table decor. 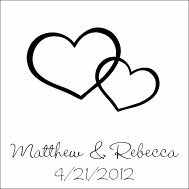 Still a fun item and will use them as wedding favors. Although these glasses were not as big as I had hoped they are still really nice. 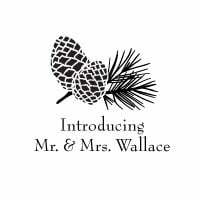 We bought these to give out to our guest at our wedding, we love them they are just a little bit smaller than we thought they would be, however they are still very neat! 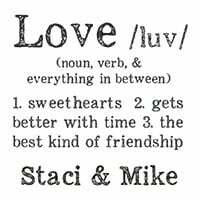 Cute but Font is too small! 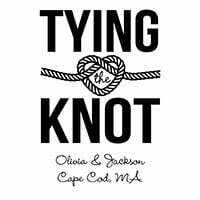 I bought this product for favors at the bridal shower. It's not one of those favors you take home and throw in a drawer. It is actually useable. 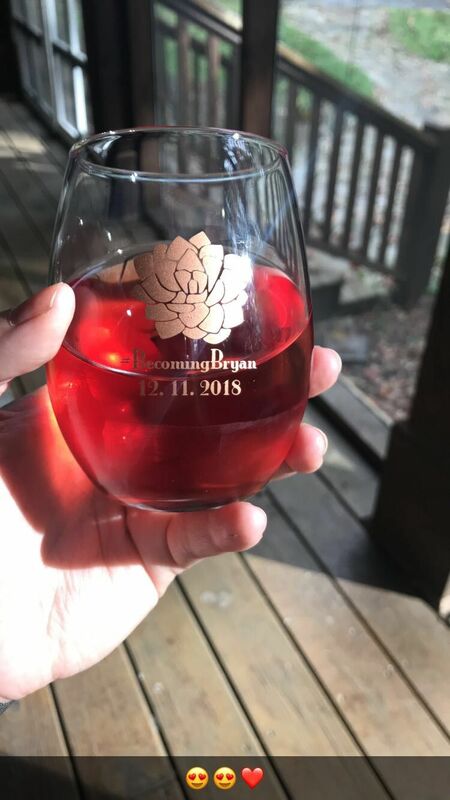 My fiance and I got the stemless wine glasses because they looked unique and fun for our wedding favors. 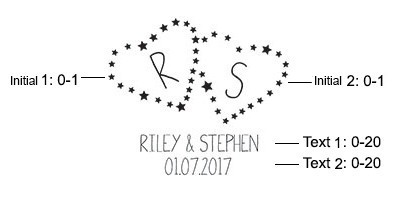 We had our names, date of the wedding and chose the heart design for our glasses. I got them late last week and just inspected every glass today. I found 5 out of 165 glasses that I deffinately can not use and there are some that have minor issues but can't notice too much. The problem with some of the glasses are the printing of our names. The first initial of my name on 4 of them was cut off. The other glass my name was smeared. 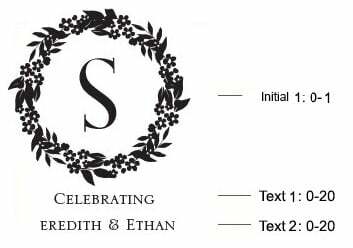 On a few others our names, design, and date don't look very centered or just look a little off. Most of them look great and We ordered extras just in case something like this happened or we ended up inviting more guests. All in all I am a little disappointed in my purchase. I wouldn't tell people not to order these because they are adorable glasses but make sure if you order these inspect each and every glass! Also you only have a week to fix any problem you have with your order once you get them. Love the glasses! The only problem I had with them is the size. I was shocked when I opened the box and they were mini wine glasses. But they super cute and the personalized message looked great! I purchased these steamless wine glasses for our wedding favors. I like them, but I thought they would be a little bigger. Bought for my daughter's wedding. Excellent value... functional and eligant. 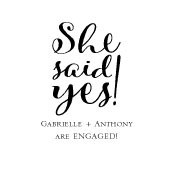 I ordered the 320 stemless wine glass as wedding favors. Pros:- Personalization - Able to choose from a variety of personalized designs.- [...]. Cons:- Wish there is an option to select the font type. 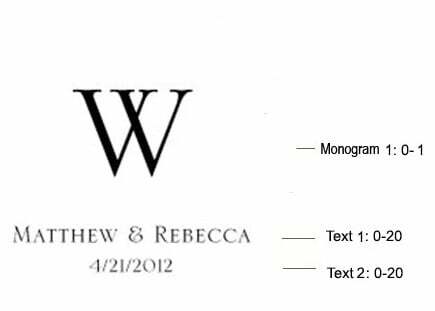 They already have pre-set font style for each personalized image.- Be sure to inspect each glass. About a dozen (out of 320) had defects, such as minor chips or the print smeared. I need to see how Beau-coup handles their customer satisfaction policy. Couldn't ask for anything better! 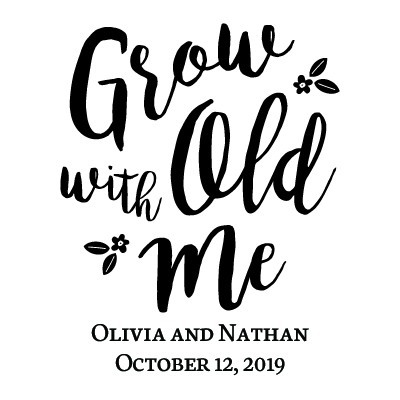 We are having a fall wedding so I ordered the glasses with the Leaves and our names & date. They are perfect! The quality was a lot better than I would have expected for the price! definitely would recommend these! My fiance and I love wine so when we saw these stemless wine glasses, we thought they were perfect! Plus, the price was great. I couldn't be more thrilled when I received my order yesterday. 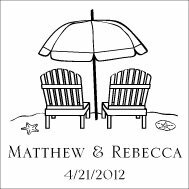 The quality was much better than I had expected and I love that they're personalized with the beach adirondack chair graphic. It's perfect for our beach wedding later this month! I can't wait to hand them out. Thank you! Q:Are you able to do customs icons or are just the one's listed available? I was looking to get a Lion head put on mine. Please let me know if that is possible or not, Thanks! A:Please contact a member of our customer service team at 1-877-988-2328 to assist you with placing a customized order. Q:Hello! I don't understand the shipping. I have to pick up in a ups near me? And how do I do? A:Please contact one of our customer service representatives at 1-877-988-2328 and they will be happy to help you navigate the purchasing and shipping process. Q:Does the lettering hold up in the dishwasher? A:We suggest hand washing these over putting them in the dishwasher, but if you do decide to put them in the dishwasher we recommend putting them on the top rack. Q:Is there a photo of the box online? I would like to see what the box looks like. A:The boxes can be seen here with the glasses: http://cdn.beau-coup.com/products/4730/119095-500.jpg There is a fold down insert on top, you can get a better idea if you click on the "box colors" tab in the options. Q:Do you have a picture of the Kraft box? 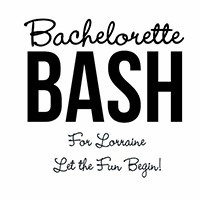 Q:What is the font used on the stemless wine glass that has an initial on each side of the & sign. 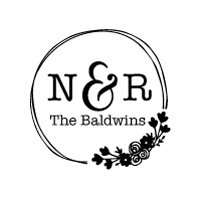 looking for font of the initials and also font used for the & sign. There is a date underneath it. 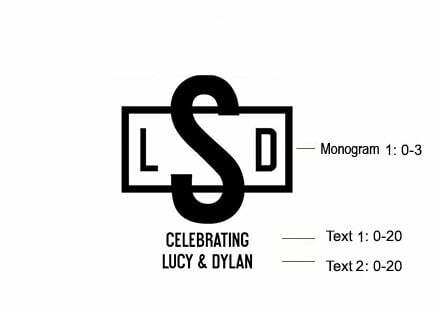 A:Unfortunately we're unable to provide the font styles as it is an exclusive design. Q:What are the fonts used on this particular glass? Q:Do the boxes have a window on them so the glass and design is visible? Or are they solid boxes? Q:What does the box look like? how does it open? 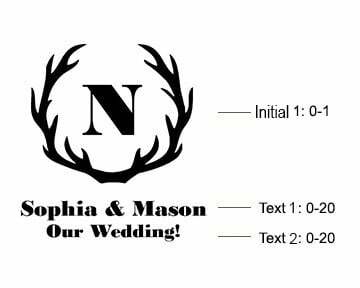 Q:I would like to use the monogram arrows with an N and a B but it is not giving me the option for a third line to place a date, is that an option for this design? A:I'm sorry if you were having trouble adding the 3rd line of text. There was an error on our site, but it's been fixed. 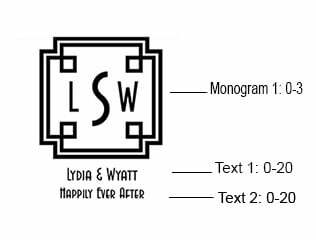 You should see all 3 text line options for the monogram arrow design. Q:Are there any other state options (specifically looking for Arizona)? A:Unfortunately, looks like Arizona isn't one of the states listed. 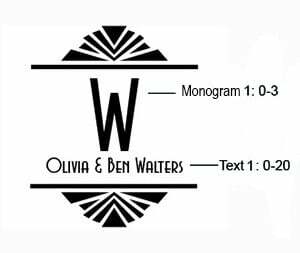 Q:Can I change the font on the personalization? Q:I will need boxes with my glass order, is that a separate order? and how much are the boxes ? I will need 120 glasses and kraft boxes. A:Yes, you will have to add the boxes to the cart separately. The boxes are sold in sets of 12, so you would need to order 10 sets of kraft boxes for 120 boxes. Q:Does the gift box come with the glass or does it have to be ordered separately? 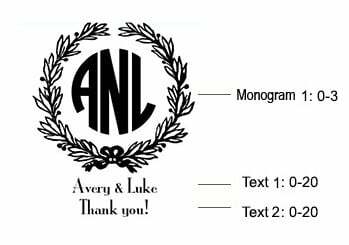 Q:Can we change the font on the monogram? 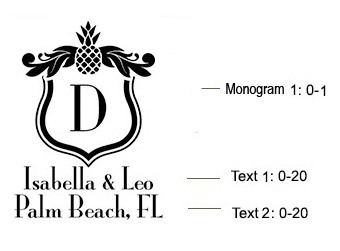 A:Unfortunately, the monogram font style is defaulted. Q:The compass design show area for text #1,#2 and #4. When I preview it with something in each line the text #4 isn't on the preview. Is it on the back side or something? A:There are only two lines of personalization. Our website is experiencing a glitch. We apologize for the inconvenience. 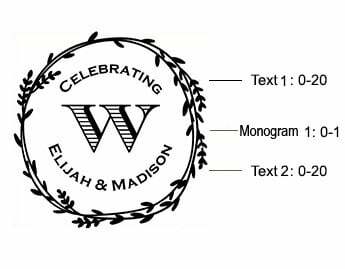 Is there a possibility of using our own monogram? Q:Can you order one glass or get a sample one before ordering a large amount ? A:Sample are not available for this item. However, it is one of products that features a preview right on the product page. Once you have filled in all the personalization fields, you can click the Preview Design button to view your glasses before purchase. Q:Do you guys only print on the glass? I have heard of glass etching which is supposedly longer lasting. Is that something you guys offer as well? If yes, how is the price? A:Most of our glass products are screen printed. Unfortunately we do not offer glass etched products. Q:Are they dishwasher safe? Or do I have to hand wash them? A:The glasses are dishwasher safe in the top rack, however we do recommend hand washing them as the imprint can come off from high pressure/heat. Q:I purchased my 9 oz. stem glasses from another company. I want to purchase your boxes but I don't know if my glasses will fit in the boxes. What are your thoughts and what is the return policy? A:The boxes should fit most standard stemless 9 oz glasses. They are 3.12"L x 3.12"W x 3.75"H and you can set up a return for them up to 30 days after delivery. Q:What is the size (dimensions: length x width) of the sheer organza bag that best fits this wine glass (i.e., the bag that is used in your video demo)? A:The one shown in the video would be the large size: 6.5"L x 5"W. We also do offer flat bottom organza bags - http://www.beau-coup.com/organzabags-flatbottom.htm which fits the 9oz. glasses perfectly too. Q:hi, when you order the gift box (set of 12) can the glasses be personalized? A:That is just the price of the boxes alone. It does not include the glass itself. Q:Is it possible to get anything in mrs & mrs? 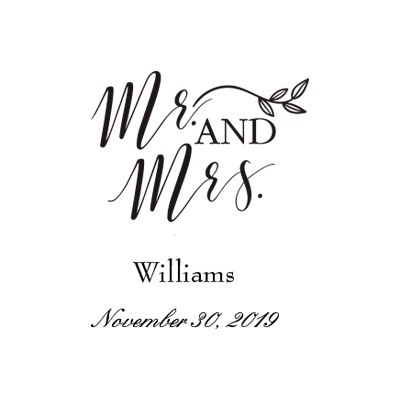 A:Unfortunately the Mr. & Mrs. design cannot be changed, however we can definitely personalize the text with Mrs. & Mrs. We are working on getting new designs for the future. Q:If I order the gift box option, can I personalize it? A:Unfortunately, the gift boxes cannot be personalized. However, we do carry tags that can be attached to the ribbon on these gift boxes. Q:Do you ship to Australia? If so is there an insurance or something in case some break while getting shipped? A:Yes, we can ship to Australia. Generally, if a customer receives a broken item, we are able to provide replacements. Q:How much does this weigh? A:The 9 oz. stemless wine glass weighs approximately 5.1 oz. Q:How do I select the design? A:Please choose a design category under Purchase Options, and select your design from there. Both design categories are listed in tabs under the main photo. Q:How many ounces does this glass hold? A:Each clear wine glass sits sturdily and holds up to 9 oz. Q:Does this item have an accompanying gift box? A:These glasses do not come with boxes, however; if you would like to purchase boxes, our Large Ivory Square Gift Boxes will work for these glasses. Q:Are they etched or printed? In one answer it says etched and then another says the print will come off in the dishwasher. A:The personalization is printed on the stemless wine glasses. It is not etched. Q:can i order this item without personalization? A:We are not able to send the wine glasses without personalization at this time. Q:Are the designs printed or etched on the glasses? A:i ordered these last year and the designs are printed on the glasses. A:The designs are etched onto the glasses. Q:Are these glasses dishwasher safe? Will the printing come off? A:The glasses are dishwasher safe. After some time, the printing will start to come off. Q:What is the 30$ set up fee? A:The $30 set-up fee covers setting up the glasses and printing them. Q:Are they actual glass, or plastic? A:These glasses are made of glass. Q:How do these come packaged? Are they individually boxed? A:These glasses do not come with any boxes or bags for presentation. We recommend purchasing our large-sized sheer organza bags. 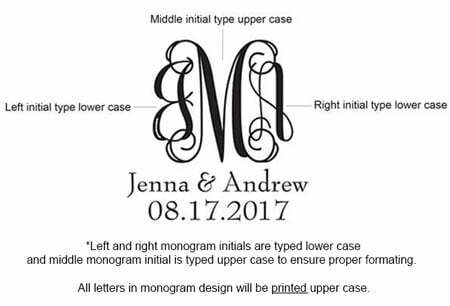 Q:Can you change the font in the monogram design? A:Unfortunately, we are not able to change the font on the design. A:Within the "Product Info" of each item page, there is a link that says "When will I receive my order?" Simply click this link to view a chart showing the exact date you will receive your order based on the time you order and the shipping method you select. This chart is accurate with the soonest dates we can get the items to our customers. 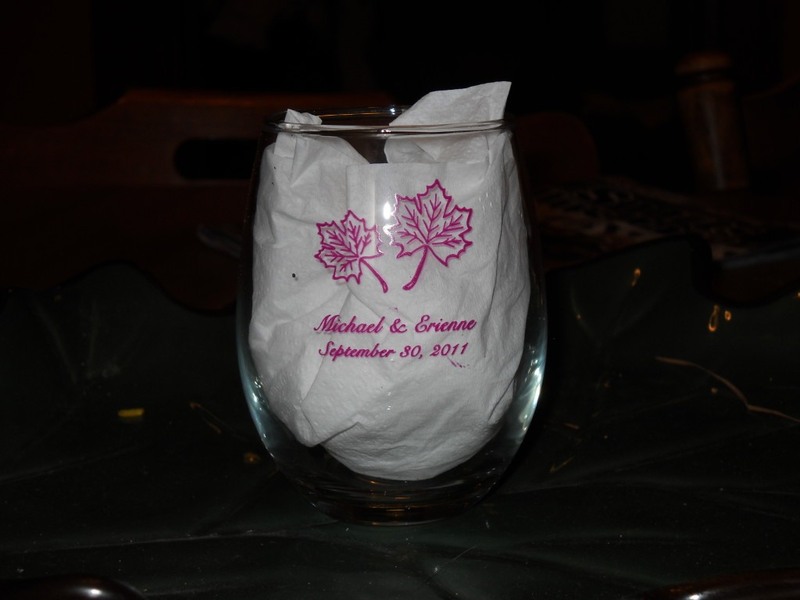 Q:Can you upload your own image to be printed onto the Stemless wine glasses? A:We are only able to use the designs shown on the product page for this item. For the contemporary wine connoisseur: personalized stemless wine glasses. They're perfect for a wine-themed engagement party, wedding or bachelor party. Boxes are sold separately and will not automatically be added to your stemless wine glass purchase. Create a wine lovers' paradise with wine cork candles at your next event.